One to the Temple of Aphrodite on the Greek island of Cyprus, where travellers from the ancient Greek civilisation called. The location of the next you are to ask Paulo Coelho who will know. A thought then came for another stone. Lincoln Cathedral, but no, a quiet corner in the graveyard of Lincoln Castle where condemned men are buried. I can even 'see' in my mind the location. The recent programme on BBC Radio 4 Nature was a wonderful celebration of the natural world. What a shame therefore the attacks I heard this lunchtime on BBC Radio 4 Feedback. 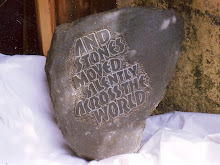 Everyone who has spoken to me about the programme has said how much they enjoyed it and how they liked the idea of stones travelling across the world. Yesterday I was chatting in a little private library, and migrating stones was one of the topics we discussed. Everyone thought it a wonderful idea. The programme was broadcasting at its best!